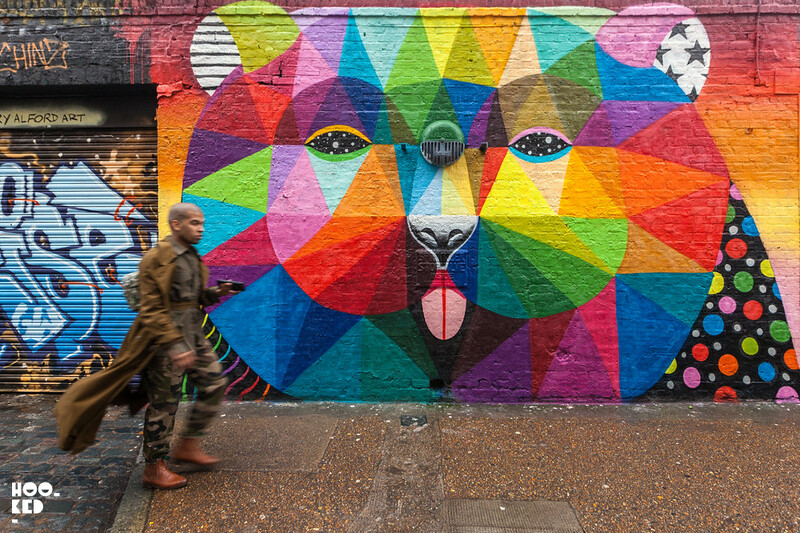 Madrid based artist Okuda San Miguel (Previously on Hookedblog) touched down in London earlier this week ahead of his new solo show at East London gallery Stolen Space. For his upcoming ‘Lost Olympus’ show the Sapnish artist is set to offer us "a representation of the mythological idols and characters from ancient Greece as contemporary icons through his geometric structures, multi-coloured patterns and dreamlike scenes as part of his continuous reflection of our contradictions, longings, intuitions and beliefs." 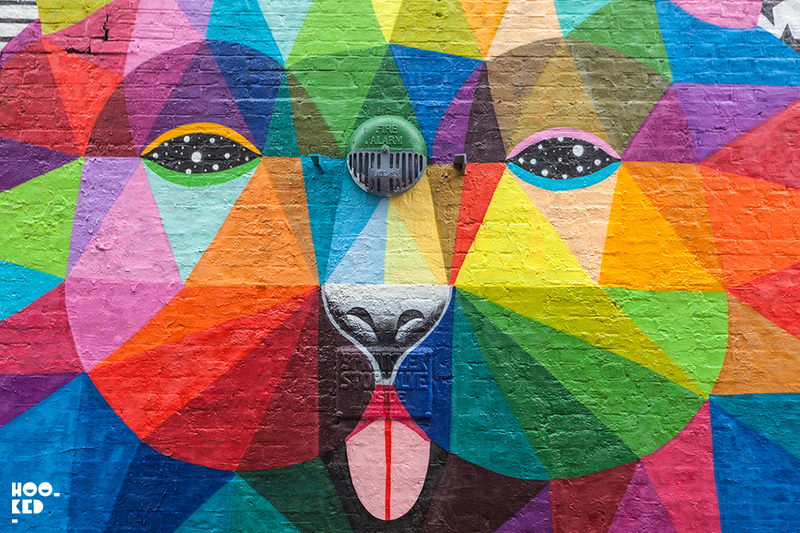 This new body of work sees OKUDA working with spray paint, embroidery and sculpture depicting deconstructed animals and bodies all in his instantly recognisable style. Those of you not some familiar with this Spanish artist or his work are sure to have seen one of his biggest project to date which has been shared across the globe online. 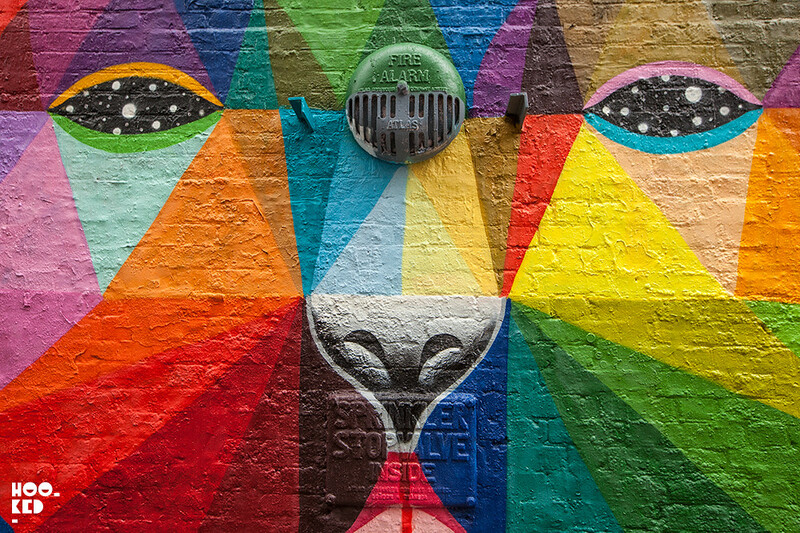 Follow our street art Pinterest Boards for even more OKUDA. In 2015 Okuda took on the huge task of painting the inside of a former church as part of its transformation into an indoor public skate-park. See for yourself below, the results of the project were truly mesmerising. Okuda San Miguel's work pictured above in the 100 year old former Spanish church situated in “Llanera” Asturias, now a public skate park dubbed Kaos Temple. With the ‘Lost Olympus’ show set to open to the public on the 2 February 2017, Okuka took the opportunity to hits the streets of East London where he painted this vibrant multi-coloured mural on Sclater Street in Shoreditch. Location : StolenSpace Gallery, 17 Osborn Street, London, E1 6TD.